I'm not working on this project much - still hand quilting most of the time - but I have been thinking about it a lot and once or twice I've got my bits out of the box and shuffled them round. It turns out this has been a useful approach. Here are the blocks I had made, laid out randomly. I've now taken out those yellow squares. The yellow was one of the things I liked about my original fabric pull, but it's not working for me here. Maybe it will be back, but not in this form. I've played around with adding sashing of some description. This photo is probably my favourite shot of this project, but clearly ten wee blocks and one little strip of sashing don't add up to a quilt. I've played around with adding an extra shape. But then it hit me: the problem I have with this (and I had it last time I worked with strings too, so I should have figured it out sooner) is that it is all too square, too straight, too tidy. I haven't been too fussy about the size of my foundation squares and have cut my strips freehand, but things still come out looking pretty neat. Of course I know that a big mass of string blocks look quite different from a handful and can acquire their own glorious mad energy, but right now this is all a bit static for my liking. So at least I understand my problem; now I just have to figure out what to do about it. Well it's an interesting problem. Looking forward to seeing how you solve it for yourself. Figuring out what is 'off' is a huge leap. I'm curious if you will change up to rectangular blocks or how you will address this feeling of being too static! I like the idea of trying different shapes, but don't forget your good old standby goose tracks. It could be just enough different to loosen up the look. I do like the addition of the top left and bottom right blocks, interested to see where you go next. I like the subtraction of the yellow, but I wonder if it will work it’s way back in with just little tidbits. Working on another project and just visiting your puzzle now and then is a great way to figure it all out. You've got some nice bits going on. This is beginning to heat up. I was wondering when you would start adding some curves to this one. A little bit of yellow here and there may make the quilt sparkle a little. I can see the yellow overpowers the rest in its present form but am not sure I understand your "too square" problem. I am definitely looking forward to seeing how you work through this. What fun! Fun! I think the yellow would work if there were smaller bits of it. I see what you mean about too square. You'll get there. 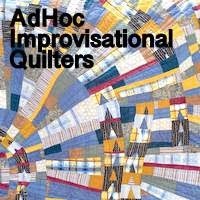 Gosh, you do inspire me to get going on something quilty!! Love to read you blog!